There’s a super-sized Endless Window to come this month, as Friday 20th October sees a multitude of musical inventiveness come to The Cumberland Arms. There’s the return of Endless Window favourites alongside some real rising stars hitting up the acclaimed night for the first time. Nervous Twitch‘s garage pop is delighting audiences all over the country, so they make well worthy headliners as their third album sees them making further waves. Long term favourites Outside Your House bring their unique, intelligent and wry home-brew take on hip-hop and show why they’re one of the North East’s most underrated gems. You also have charming lo-fi rockers japanese tv club and returning loud thrillers The Noise and The Naive bringing their garage rock thrills. Throw in Endless Window DJs playing some absolute bangers until late, Endless Window’s endlessly joyous nights show no sign of letting up any time soon. 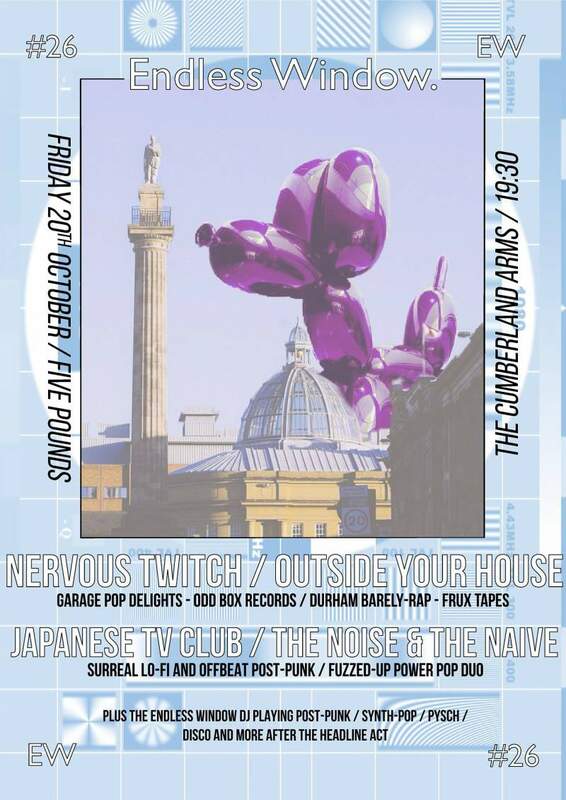 Endless Window is at The Cumberland Arms, Newcastle on Friday 20th October.